BRISTOL, Tenn.—Friday night’s Food City 250 wasn’t exactly a battle royal, as far as the outcome was concerned. Heck, it wasn’t even a food fight. 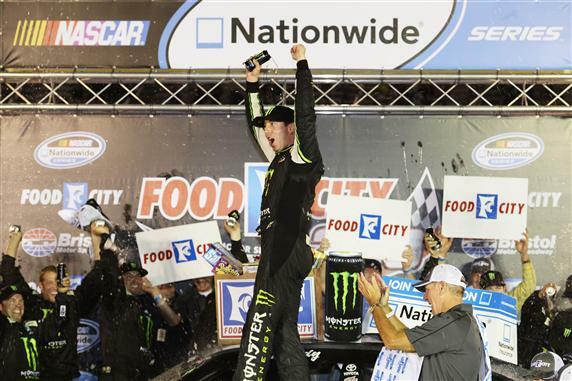 In fact, when Kyle Busch wins the Coors Light Pole for a NASCAR Nationwide Series race, as he did Friday afternoon at Bristol Motor Speedway, the rest of the field might as well start writing concession speeches. Pulling away from runner-up Brad Keselowski over a green-flag run that consumed the final 72 laps, Busch won his sixth NNS event at the .533-mile short track. The victory was his ninth of the season and the series-record 60th of his career. In winning for the 15th time at Bristol across NASCAR’s top three series, Busch led 228 of 250 laps. The pole he won earlier in the day was his sixth of the season. Each time, Busch has gone on to win the race. The victory set up a try for a second weekend sweep at Bristol for Busch, who started with a NASCAR Camping World Truck Series win on Wednesday night. To win Saturday’s Irwin Tools Night Race in the Sprint Cup Series, however, Busch will have to come from the back of the field, having spun during his Cup qualifying attempt Friday afternoon. Austin Dillon ran third behind Busch and Keselowski. Justin Allgaier was fourth followed by rookie Kyle Larson. Brian Vickers’ wreck out of Turn 4 on Lap 167 continued a succession of trouble for series championship contenders. By the time Vickers nosed into the inside wall on the frontstretch, Regan Smith already had lost two laps pitting under green because of a loose wheel. Sam Hornish Jr., the points leader entering the race, also struggled, losing a lap to Busch on the track. Shortly after a restart on Lap 179, Hornish’s Ford slapped the outside wall in Turn 4 and fell back to 13th, one lap down. Elliott Sadler also went a lap down with an ill-handling car but got it back with a free pass as the highest-scored lapped car after the caution for Vickers’ accident. Sadler finished 10th, two positions ahead of Hornish. Smith was 21st and Vickers 24th.